Choosing fish for your entree is smart -- until it's salted, breaded and fried. 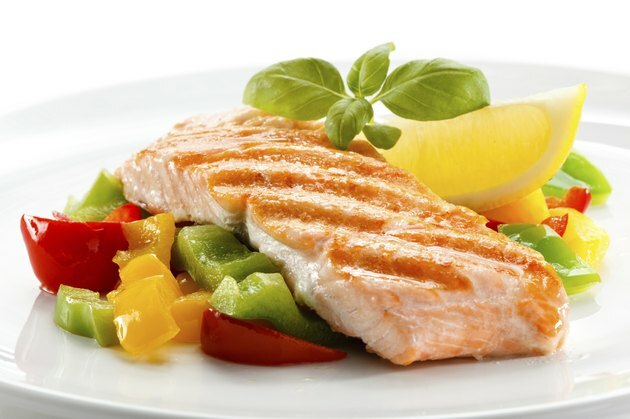 For the healthiest fish preparation, start by selecting a sustainable fillet. The Monterey Bay Aquarium's Seafood Watch notes U.S. catfish, Alaskan salmon, U.S.-farmed rainbow trout and Pacific halibut as some of the top options. Then, cook it in a manner that limits sodium, fat and calories while still offering the taste you desire. 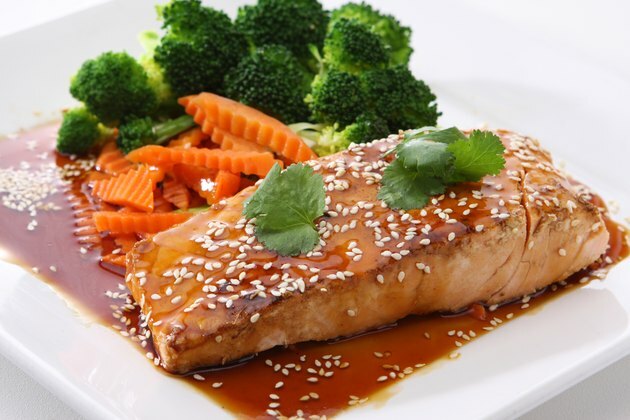 Steaming offers two benefits for cooking fish: It doesn’t dry out the flesh, and it doesn’t require any added fat. All you need is a piece of equipment that holds the fish while allowing it to steam. One option is a steamer basket, which rests above a pot of boiling water, or a Chinese bamboo steamer. This method of cooking doesn’t lend itself to salting; the salt will drip off as it steams. Additionally, other than microwaving -- which is simply another form of steaming -- this method of cooking retains the most nutrients. A 1-inch-thick fish fillet could take anywhere from six to 15 minutes to steam, depending on which variety you choose. Poaching, which refers to cooking the fish in a simmering liquid, is most effective with firm fish fillets such as Pacific halibut, yellowfin tuna and lake trout. The healthier the liquid you choose for poaching, the healthier the end result will be. Options include fish stock and water seasoned with onion, garlic and herbs. To cook, bring the liquid to a simmer, but don’t let it boil. Simmer the fish until the center is opaque and then remove it from the pan with a slotted spatula. 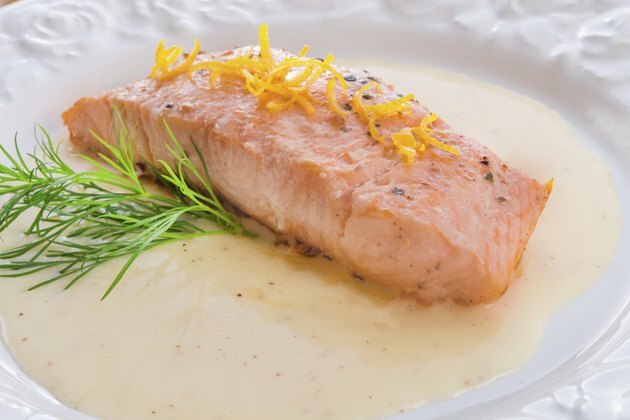 Because its natural oils prevent drying, salmon is a top choice for broiling, a cooking method that exposes the fish to direct heat in the oven. This dry cooking method requires no oils. Other oil-rich fish options include tuna, sea bass and mackerel. 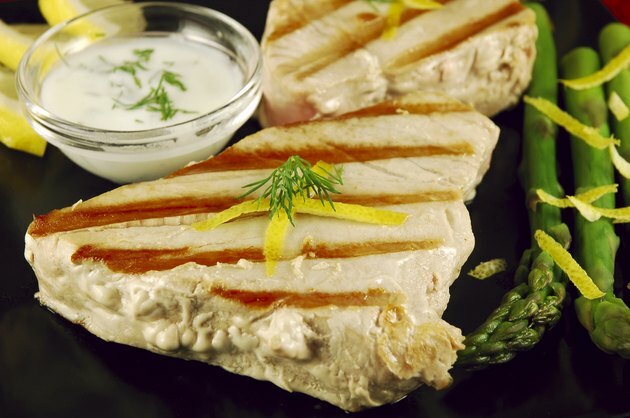 Leaner cuts of fish should be marinated before broiling. A half-inch piece of fish will take approximately six minutes to cook for rare, and nine to 12 minutes for medium or well-done. Grilling is another direct-heat cooking method, but the heat comes from the bottom rather than -- as in broiling -- from the top. The same candidates for broiling work well in grilling. To cook fish directly on the grill, lightly brush the fillet with extra-virgin olive oil so it doesn't stick. 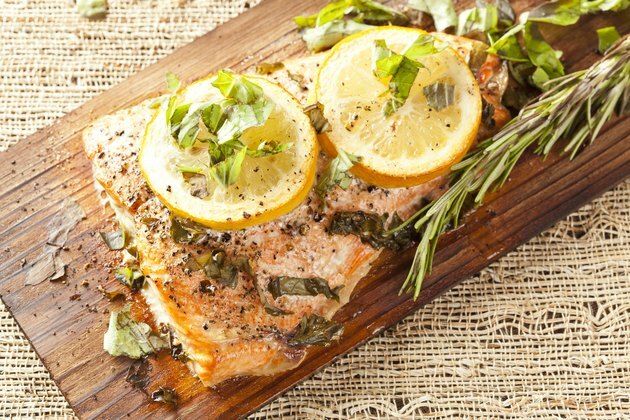 To infuse the fish with a smoky flavor, grill it on a wooden plank -- cedar, maple or hickory -- for approximately 20 minutes. 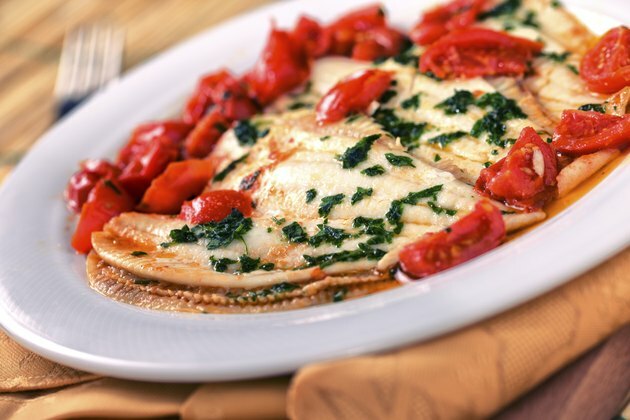 Perhaps the simplest method for cooking fish is baking. Season the fish with herbs and spices or slices of lemon or lime and arrange the fillets on a baking sheet covered with parchment paper. Bake the fish for seven to 10 minutes per inch of thickness.